This past Friday night we finally had our denaming and renaming ceremonies. 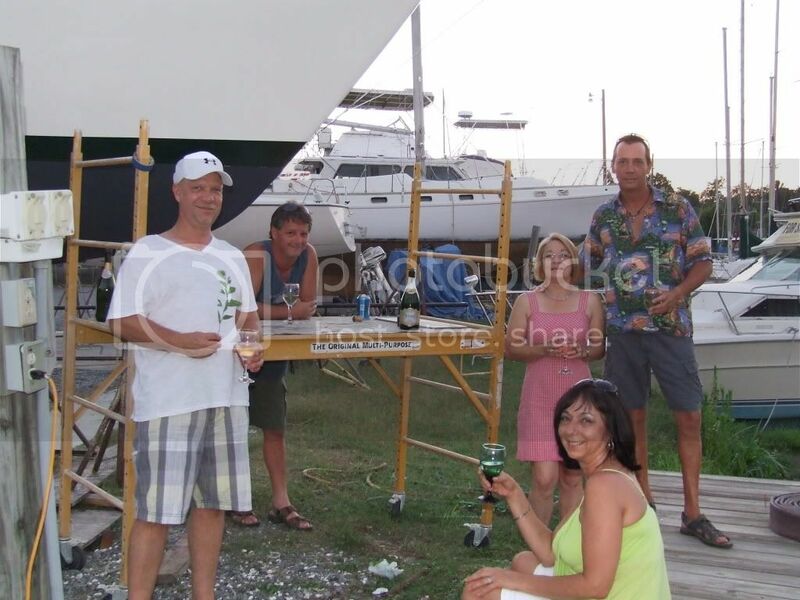 After our boat almost slipped off its stands earlier that day we thought it was the perfect evening to have a drink! 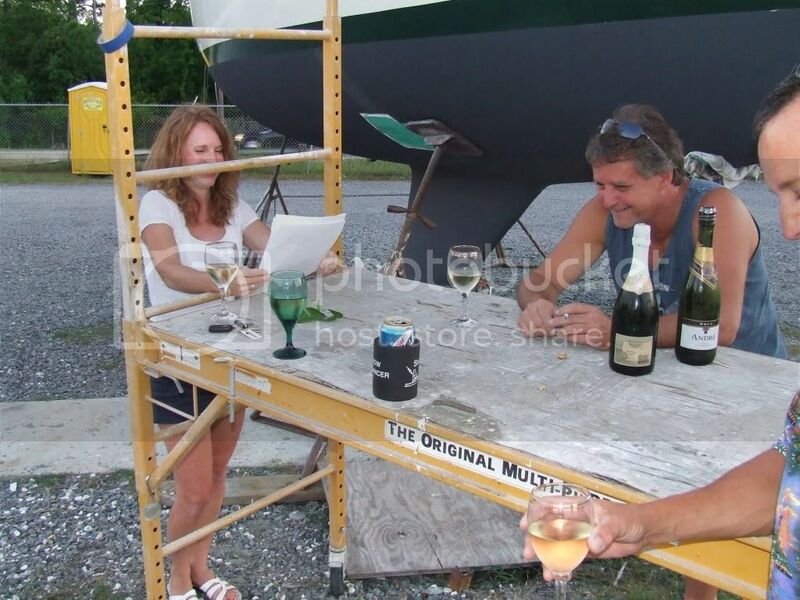 I searched the internet for ceremonies, and chose Vigor's Denaming Ceremony (John Vigor is a boat writer and editor) and Commander Bob's Boat Christening Ceremony. We're not superstitious people, but we figure it's better to be safe than sorry! We don't want to do anything to upset the gods, and we need all the good luck we can get! Before the ceremony I went through the entire sailboat to make sure that I removed anything with the old name (Warwick) on it. The prior name was also removed from the boat and the area sanded well. Our life ring has the old name on it, so I will sand it off and paint it before it goes back on board. "In the name of all who have sailed aboard this ship in the past, and in the name of all who may sail aboard her in the future, we invoke the ancient gods of the wind and the sea to favor us with their blessing today. Mighty Neptune, king of all that moves in or on the waves; and mighty Aeolus, guardian of the winds and all that blows before them: We offer you our thanks for the protection you have afforded this vessel in the past. We voice our gratitude that she has always found shelter from tempest and storm and enjoyed safe passage to port. Now, wherefore, we submit this supplication, that the name whereby this vessel has hitherto been known ____, be struck and removed from your records. Further, we ask that when she is again presented for blessing with another name, she shall be recognized and shall be accorded once again the selfsame privileges she previously enjoyed. In return for which, we rededicate this vessel to your domain in full knowledge that she shall be subject as always to the immutable laws of the gods of the wind and the sea. In consequence whereof, and in good faith, we seal this pact with a libation offered according to the hallowed ritual of the sea". "For thousands of years, we have gone to sea. We have crafted vessels to carry us and we have called them by name. These ships will nurture and care for us through perilous seas, and so we affectionately call them "she". 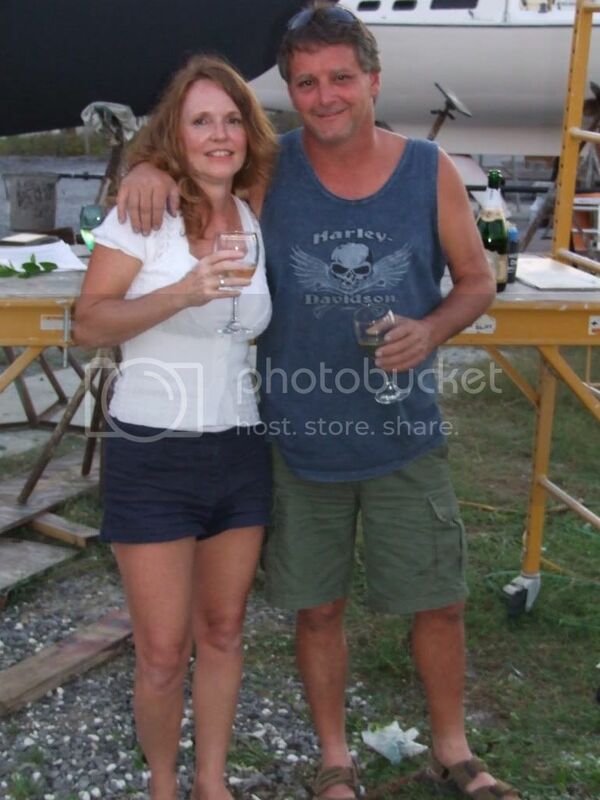 To them we toast, and ask to celebrate (name of boat)". Then everybody raises their glasses and shouts "To the sailors of old... to (name of boat). Everybody takes a sip. Then follow with: "The moods of the sea are many, from tranquil to violent. We ask that this ship be given the strength to carry on. The keel is strong and she keeps out the pressures of the sea." Again the glasses are raised, and everybody shouts, "To the sea...to the sailors of old...to the sea!" Another sip. Then: "Today we come to name this lady (boat name), and send her to sea to be cared for, and to care for the (name of family) family. We ask the sailors of old and the mood of God that is the sea to accept (boat's name) as her name, to help her through her passages, and allow her to return with her crew safely". Again, raise the glasses and shout, "To the sea...to the sailors before us...to (name of boat)." A long, last sip. 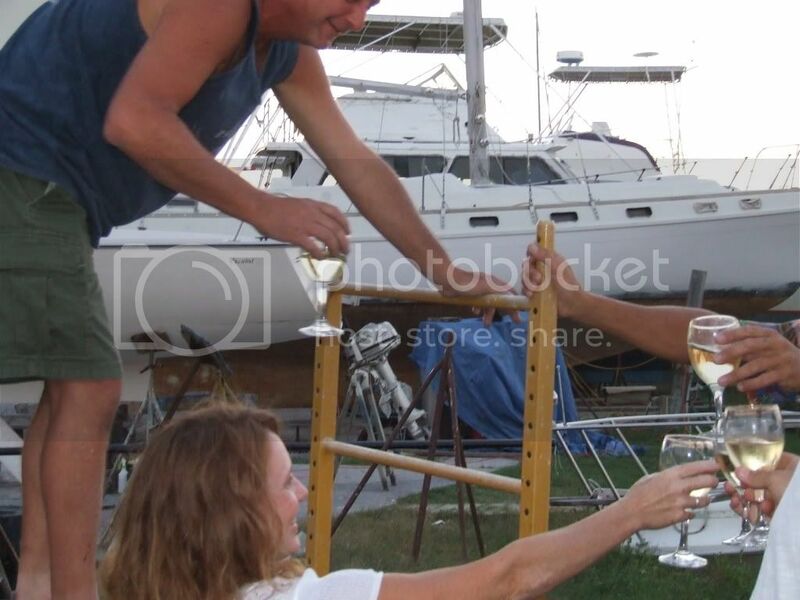 Ken then poured the last half of the god's champagne onto our sailboat's bow spread and we enjoyed finishing off the rest of our own champagne. Ken also layed a branch of green leaves (from our friend, Ted's, place) on the deck to ensure safe returns. The following morning Ken put on the new name and port. Our Catalina has her new name, Nirvana! 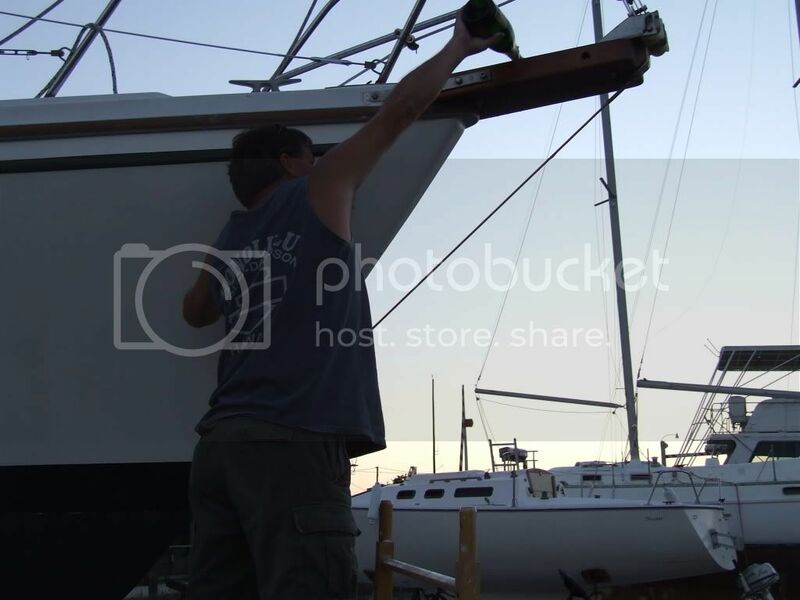 This past weekend Ken also sanded and painted the areas where the stands had originally been, installed the swim ladder on the stern, re-fiberglassed the interior over the strut bolts (under the fuel tank), and painted our new 3-blade prop. The prop did not include the castle nut that we ordered along with it, so yesterday we looked all over town for a brass castle nut with no luck. We're having Catalina Direct ship us the nut and hopefully we'll have it by tomorrow afternoon. All we need to do now is attach the prop, re-install the fuel tank, lightly sand and repaint the life ring (to remove the old name) and wait for the rain to stop! We should be back in the water just in time for the 4th of July! How fun. It's been a long time since I've gone to these parties, I mean denaming and renaming, but they are indeed lots of fun. You are right you don't want to anger the Gods. Good for you. wow you guys have done an incredible job. 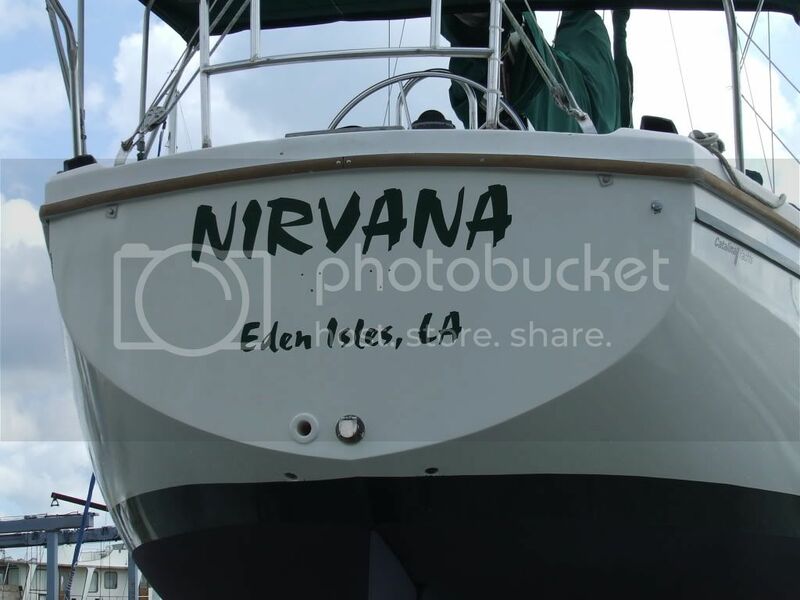 Nirvana looks like a brand new boat. 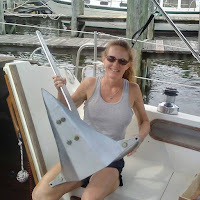 have a GREAT time sailing this weekend!! Lucky you - boat in the water for the 4th!! We were hoping but it doesn't look like it :(. Congrats on a successful ceremony!! Love the name - great name for a boat! Thanks ya'll! 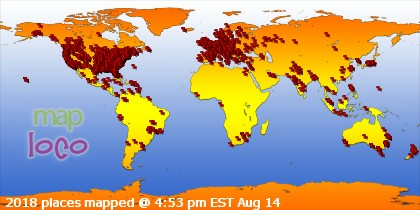 Now it's not looking like we'll be in for the 4th either. Raining through Monday! Maybe we should have used better champagne?! Just caught up the last two posts, wow quite some fears. I am glad all went well. She'll be soon enough in the water... there is no schedule in cruising :). So, Cheers to "Nirvana"! It's beautiful name, and I love the port of call too. Now you tell me!! I had no idea that all this was involved in the renaming of a boat. No wonder we've had so much trouble (I have to blame something!). Laura, are you saying you changed the name without a ceremony? That's probably to blame for your rough start! =) I think it's a good excuse, too. Thanks to all for the complements!